My quest for a good rib recipe started a couple of years ago when I took Mr Steph back to my home town a few years ago. During our stay we ordered room service - one of the meals being beef ribs. 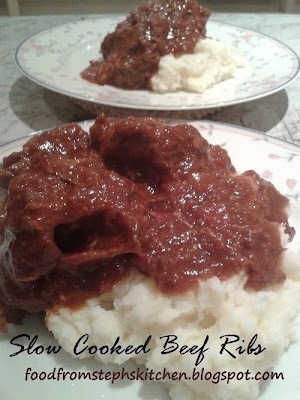 They were tender, with the meat just falling off the bone, sitting on a big bed of creamy mash with a rich thick sauce. Since then I have experimented with a few different recipes to get one that would melt in my mouth. All of them have been great, but it didn't quite hit the spot. 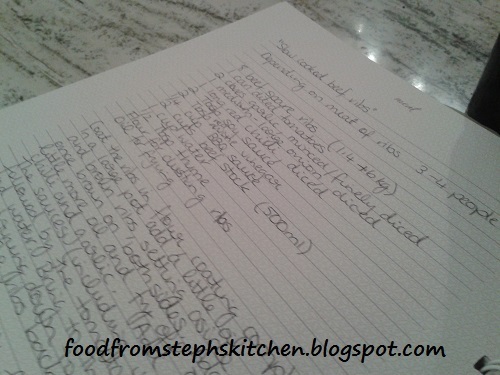 Then I came up with a recipe that is just perfect - so much so that it's now made it's way into my cook book! The meat on these ribs just came completely off the bone and was just so tender, with a thick and gorgeous tomato chilli sauce. If you prefer to nibble the meat off the bone you can always cook the ribs for less time (around 1-1/2 to 2 hours), remove them from the sauce and put them into the oven - but I like the meat just falling apart and cooking it for this long also creates a lovely thick sauce that will have you spooning it out of the pot like a soup (no, I didn't do that at all!). In a little bowl add some plain flour and some freshly cracked pepper (just a little), mixing the pepper through before coating each of the ribs on all sides. In a large pot or stock pot add a little bit of oil (about 2 Tbsp) on a medium to high heat and brown off each of the ribs in stages, turning to brown on all sides. Remove the ribs from the pan and set aside on a plate while you start on the sauce. Add a little more oil (no more than 1 Tbsp) and fry off the onions, chilli and garlic until the onions have softened. Next add each of the sauces and vinegar, stirring through the onions and chillies and cooking for 30 or so seconds before adding in the tomatoes. Now simply turn the heat to low, add in your stock and water and bring the liquid to the boil. This is the base of your lovely rich sauce. It will thicken as it cooks away for hours. Trust me, it will be amazing! Add the ribs back into the pot as well as any juices on the plate, pushing each rib into the sauce so that it's covered as much as possible. If you don't have a deep pot and the tops of your ribs aren't covered completely simply grab a spoon and pour some of the sauce over the top of the ribs. Now all that's left is to pop of the lid, turn the heat down to as low so that your sauce and ribs simmer away for 2 1/2 - 3 hours. 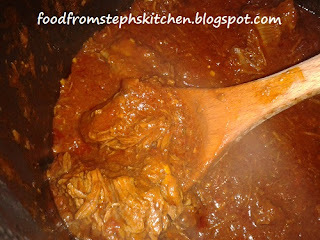 To make sure that nothing sticks to the bottom I like to stir the sauce every 30 or so minutes. I think I might be a little paranoid but at least I don't have to deal with a burnt sauce or it sticking to the bottom! These ribs are perfect served on a bed of mashed potato but you can also serve it on rice or simply have it with a side salad. However I love to have something to soak up the sauce with - although I can guarantee you will be drinking the sauce out of the pot!